This is just a partial laundry list of the fears many women have about becoming a mother. When you add others, things like never losing the pregnancy weight, not having enough time and money or, scariest of all, not being a good mother, it’s a wonder anyone chooses to have a child in the first place. Of course, being afraid doesn’t mean that you aren’t also happy and excited about becoming or being pregnant; it just means that you’re facing a lot of unknowns. 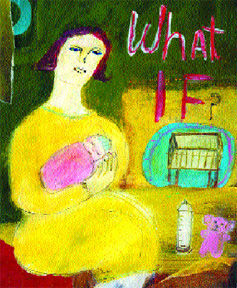 What can help is honestly discussing your concerns with your partner, friends, other mothers or, if the fears are severe, with your doctor or another professional, says Diana Dell, M.D., an assistant professor in the departments of obstetrics-gynecology and psychiatry and behavioral science at Duke University in Durham, N.C. Preparation can help, too. Here are some planning tips from experts, as well as moms who’ve felt the fear and lived to tell about it. Fear I’ll never have flat abs again. To prepare Putting on too much weight during pregnancy can leave you with a hard-to-banish belly. To help make sure that she and her baby were healthy but that she didn’t gain too much, Paula DeStefano, 38, of Red Bank, N.J., consulted a nutritionist early in her pregnancy. “I found out I had started eating too much in my first trimester,” she says. “I adjusted my diet, and after giving birth, my body pretty much went right back to where it was.” Instead of restricting your food intake, choose foods that deliver maximum nutrition without excess calories. Exercise also can help your body bounce back, and making the commitment early (with your doctor’s OK) will help you stick with pre- and postnatal exercise programs. For the latter, consider the season, advises Jenny Otto, a certified personal trainer at Chelsea Piers in New York City. If you’re having a winter baby, stock up on workout videos with short (about 20-minute) programs. A summer baby coming? Invest in a jogging stroller. Fear I won’t be a good mother. To prepare Such thoughts and reflections are actually strong indications that you will, in fact, be a good mom. That said, accept that you don’t have to be a perfect one. The late British pediatrician and psychoanalyst D.W. Winnicott said that any woman can be a “good enough” mother if she handles her own problems like an adult and learns to trust her instincts over expert advice. To find out what such a good-enough mother’s life is like, read Anne Lamott’s Operating Instructions (Fawcett Books, 1994), Vicki Iovine’s Girlfriends Guides (Perigee Press, 1995-2001) and As Good As I Could Be: A Memoir of Raising Wonderful Children in Difficult Times by Susan Cheever (Simon & Schuster, 2001). Fear I’ll never get the sleep I need.To prepare You can try taking naps with the baby, but don’t make yourself crazy if that conventional advice doesn’t work for you. Consider adopting trainer Otto’s attitude: “I deal with lack of sleep by telling myself it’s temporary,” she says. “Fighting it would just lead to panic, anxiety and stress.” In other words, you’d get even less sleep. Fear I tend to get blue, and I’m afraid I’ll get postpartum depression.To prepare “It’s not uncommon for a woman to experience her first episode of depression after giving birth,” says Dell. “If you take the time during your pregnancy to learn what the symptoms are, you’ll be in a better place to seek help if you think you need it.” Tell your doctor about any past episodes of depression, anxiety or panic, and minimize triggers by asking for help when you need it, keeping expectations realistic and avoiding other big lifestyle changes, such as moving, buying a home or changing jobs, until you’ve adjusted to motherhood. Fear I’ll never have a clean, orderly house again.To prepare Acknowledge your new priorities (a happy, healthy baby is more important than a tidy home), determine your “cleanliness comfort level,” then either hire a cleaning service or delegate specific chores to your partner and resist the urge to criticize the way he does them. Instead of doing as much housework as possible while the baby sleeps, use at least some of that time to take care of yourself, advises Candace Hammond, a certified life coach in Cape Cod, Mass. “You cannot give from an empty vessel,” Hammond says. “Fill yourself up, and let someone else clean the house.” Need more motivation to slack off? Keeping a too-clean house — using antibacterial soaps, for example — may impair your child’s developing immune system. Fear I won’t have time for my husband/work/baby/self, etc.To prepare “Focus on one thing you want to stay committed to, then figure out what you’ll need to keep that going,” Hammond says. That may mean lining up a sitter for Saturday-night “dates” with your partner or twice-a-week swims. Figure on starting this schedule when the baby is about 6 weeks old. Before your baby arrives, establish priorities by listing the things that must be done and those you can let go of. Then figure out who’s going to take care of essential tasks you can’t do. For instance, hire someone to walk the dog each morning if you have to get the baby ready for day care and yourself ready for work.